Those three words describe the range of emotions I experienced when I saw this picture. Here's the story. I was jeje-ly looking for a picture on Flickr to add to this blog post. Somehow, I stumbled on this one. It is a picture of a lecture hall / auditorium at the University of Lagos. Normally, I would have chosen maybe a primary school or secondary school themed picture for a post like this, but this picture is different. I had to share it. You see, I took two different classes in this very auditorium. If you follow my education posts on this blog, you would have heard me mention the fact that I attended UNILAG for about two years before coming to live in the US. 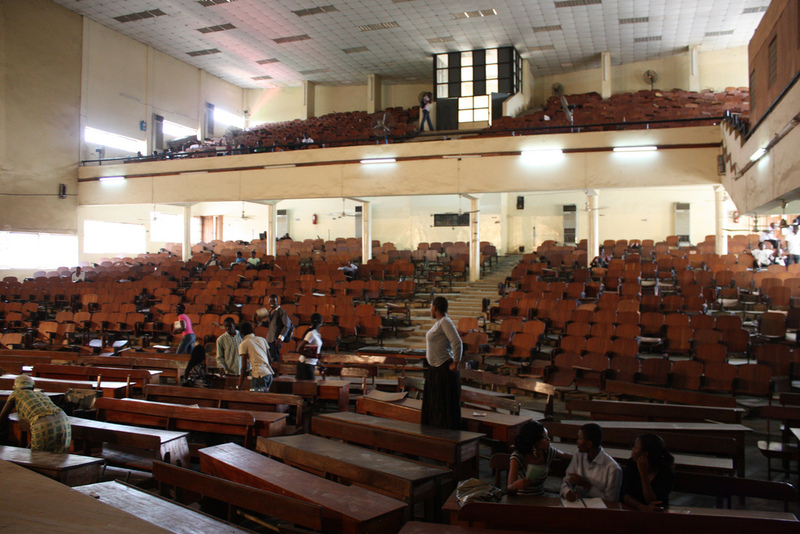 Well, this was one of the lecture halls where I took "those" 100 level classes (two computer classes actually). I remember clearly coming late for some classes and having to go upstairs to sit on the stairs (where I could not see the lecturer's face) or stand outside in the over-crowded hall (same result). The sad part is that as I look at this picture (and the other pictures from this set), it is clear to me that nothing has changed. The chairs, building, etc are the same. It looks like (judging from this picture) no serious attempt was made to refurbish, maintain or renovate this hall. I am almost certain that the rest of the campus will tell the same story. A visit to public schools in Nigeria will probably tell the same story as we notoriously have a poor maintenance culture. For years, the debate around Nigeria's educational system has been centered around two schools of thought: those who believe that the system needs to be overhauled (completely dismantled and built from the ground up), and those who feel that reformation is the way forward (i.e. give the current system a "makeover," focusing on areas that need major changes). I don't think we need a complete overhaul, because as problematic as the current system is, it actually works. Many talented and successful Nigerians are products of that system, meaning that we must be doing something right. What I think though is that we need serious reformation, and it needs to happen fast. Add your voice: Do you think our educational system needs a complete overhaul or simply a reformation? Why? Kindly share. I agree with the last paragraph of your post. What we really need is a reformation. My thoughts exactly. Reformation gets my vote. As a strong advocate of re-branding education in Nigeria, I would say what we need is a makeover like you described. Firstly, major infrastructural changes and basic amenities are needed (these are the backbone. Education would be irrelevant when there's insecurity). Then, we can talk of curriculum changes from the outdated and ineffective ones, better rewards (not just salary now) for our prestigious teachers, embracing E-learning methods and quite a number of other essential things. All these sound like an overhaul but what if we call it a Reformative Overhaul? Yes? no? Lol! I completely agree with this. My ernest concern is when are we starting the reforms? Do our leaders in the sector have pragmatic workplans for these? Michael: It's good to know there are people who think like me, as per re-branding. I like your own interpretation: Reformative Overhaul. Sounds good. You've made valid points: infrastructure, security, before education. The annoying part is that it loos like stuff the government should do. If we keep waiting for them though, I think it's a waste of time. But how do you get around that? Ubong Ettang: We ought to have started yesterday. As far as practical plans, I am sure there are a few people in the public sector who care. Whether their efforts are making enough impact though is questionable. Right now, it looks to me like private individuals take educational reform more seriously than the government, even with limited resources. Concerned Nigeria Citizen: I admire your passion and applaud your activism. However, I am VERY skeptical about this bill you're referring to. I am yet to see politicians pass a bill that will disfavor them. For your sake, I hope it's worth the trouble. I will check out your Facebook page. Thanks for sharing.